There is wide variation in upward mobility across US states. This column uses a study of child schooling in 1940 to show that upward mobility in educational attainment is determined in part by local public education policy, with mobility greater in states with high teacher salaries, for example. This shows the potential of public education to improve equality of opportunity. Countries differ markedly in intergenerational mobility, that is, in the extent to which socioeconomic success passes down from one generation to the next. For example, studies analysed by Hertz et al. (2008) showed that intergenerational persistence in educational attainment is highest in Latin American countries, and lowest in Nordic countries. In recent decades the US has been somewhere between the two. Recent scholarship shows that there is wide variation in intergenerational mobility, even in the US. Chetty et al. (2014a) and Chetty and Hendren (2018) focus on the economic success of children born in families in the lower-middle part of the income distribution (at the 25th percentile), finding that children in these families tend to make headway up the income ladder in some locations, but make little progress in other locations. This research is important: it highlights that local context may have a role in shaping intergenerational mobility. This evidence prompts us to asks if there are contextual factors that can be shaped by policy to improve upward mobility? We find that in recent US history, upward mobility in educational attainment is determined in part by local public education policy (Card et al. 2018). Increases in schooling quality – especially higher teacher salaries – result in increased educational attainment. Children in families with poorly-educated parents gain most. Our evidence comes from a study of child schooling in 1940. We use 100% population records from the 1940 Census to study the educational choices of children aged between 14 and 18 who were living with at least one parent. In 1940, the Census Bureau collected for the first time information on educational attainment for essentially the entire population, which means we can see intergenerational links in millions of families. We combine these data with state-level administrative data on local schools. In the states with de juresegregation, these were recorded separately for black and white schools. Importantly, in 1940, most young people completed their education before leaving home. For instance, at age 18 nearly 90% of white sons were still living with parents, but nearly 60% had left school. This allows us to construct simple measures of educational attainment that capture upward mobility relative to parents, and to conduct an analysis of factors that shape educational outcomes within families. One benchmark measure of upward mobility focuses on children aged 16-18 whose parents completed between five and eight years of school. This is roughly in the middle of the parental educational distribution. For these families, we could calculate the proportion of children who attained at least ninth grade, and so moved up the educational ladder. 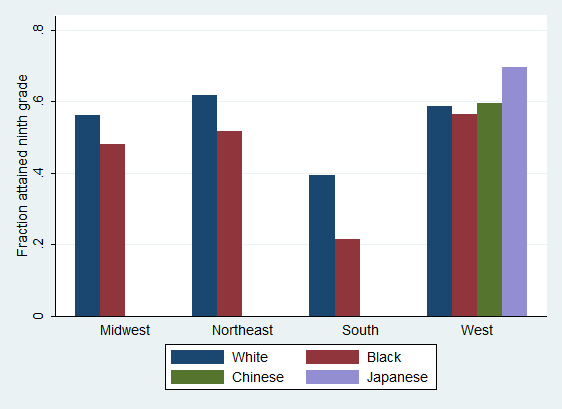 Figure 1 shows large differences in this simple measure of upward mobility by region and race/national origin. For white families, upward mobility was much lower in the South than elsewhere. Among black families, upward mobility was lower yet in the South, but was similar to white upward mobility in the West. Chinese-American and Japanese-American families (who (who lived primarily in the West) had upward mobility rates similar to, or higher than, whites. Source: Card et al. (2018). We find extraordinarily wide variation in upward mobility across states. Figures 2 and 3 provide maps for sons, in white families and black families respectively (the maps are similar for daughters). Upward mobility for white sons was lowest in Tennessee (0.35) and Kentucky (0.37) and was highest in California (0.82) and Utah (0.83). For black sons, upward mobility was very low in the Deep South (only 0.09 in Mississippi and 0.15 in South Carolina and Georgia), but was similar to white sons in California (0.83) and Minnesota (also 0.83). State-level rates of upward mobility – as quantified by ninth-grade attainment or with more sophisticated econometric techniques – are highly correlated with schooling quality measures such as average pupil-teacher ratios and teacher salaries. Figures 4 and 5, which provide results for daughters, illustrate this. 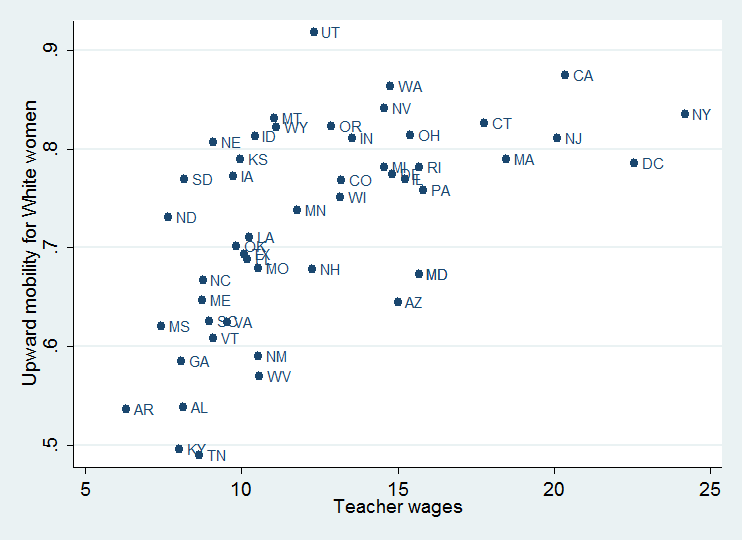 Upward mobility was generally higher in states with relatively high teacher salaries.1 We have similarly persuasive evidence to show that upward mobility was generally higher in states with relatively lower pupil-teacher ratios. More detailed econometric analyses show that for both black and white families, within narrowly-defined parental education groups, school-quality metrics are strongly related to schooling attainment for both sons and daughters. These estimated effects are largest for children with the least-educated parents, and smallest for those with the most-educated parents. Thus higher average school quality has helped narrow the human capital disparities between generations. Of course, school policies themselves – decisions about school staffing, teacher salaries, and so on – are to some extent shaped by communities (in other words, they are endogenous). This complicates interpretation of the correlations we observe. The relationship between school quality and upward mobility further complicates matters, because that may be driven in part by local economic factors, which vary across locations. To sort out these issues, we conduct a detailed analysis of schooling attainment among black children in the segregated South, using county-level data on pupil-teacher ratios and average teacher salaries. The focus is on the effects of average teacher salaries (which we show are strongly related to the average education of teachers in each county). In the era of Jim Crow and political disenfranchisement, most school resource decisions were made by white politicians, with little input from local black families. For example, in many Southern states local salaries were shaped in part by state-level minimum wages for public school teachers, with rates that were lower for black teachers. As an example, the annual minimum in Georgia was $280 for white teachers, and $175 for black teachers. To isolate the effects of these salary differences while controlling for local economic opportunities, we construct contiguous county pairs on either side of the borders of Southern states. 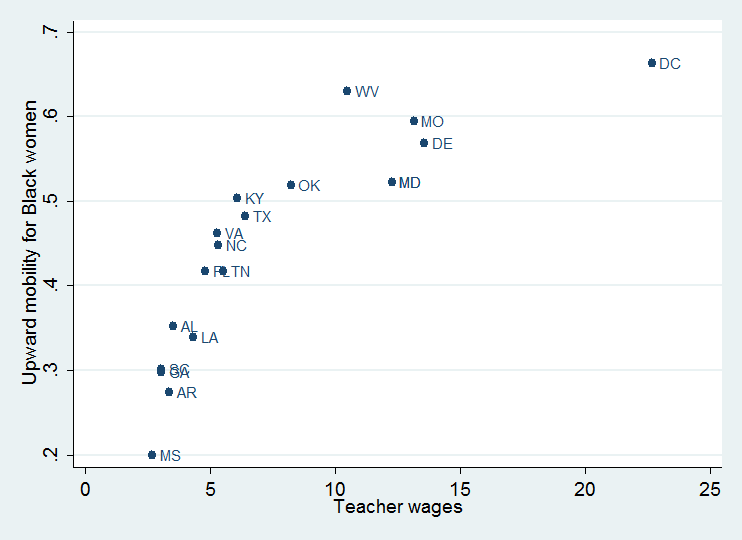 We find that estimated teacher wage effects in these analyses are close to those inferred from state-level analyses, suggesting that there may be relatively little concern about biased inference in those models. These analyses increase our confidence in a causal interpretation. Improving school quality appears to increase upward mobility. This shows the potential of high-quality public education as a viable means of improving equality of opportunity across generations, as it suggests that the availability of high-quality public schooling is a key determinant of upward mobility for children born with low socioeconomic status. Differences in schooling opportunities were an important contributing factor to labour market inequalities for the rest of the century. Black-white differences in school quality during the era of school segregation, in particular, were doubtless a key precursor to large persistent black-white disparities in a range of socioeconomic outcomes, including income, health, and the success of subsequent generations. Card, D, C Domnisoru, and L Taylor (2018), “The Intergenerational Transmission of Human Capital: Evidence from the Golden Age of Upward Mobility,” NBER working paper 25000. Chetty, R, N Hendren, P Kline, and E Saez (2014), “Where is the land of Opportunity? The Geography of Intergenerational Mobility in the United States”, Quarterly Journal of Economic s129(4): 1553-1623. Chetty, R and N Hendren (2018), “The Impacts of Neighborhoods on Intergenerational Mobility I: Childhood Exposure Effects”, Quarterly Journal of Economics 133(3): 1107-1162. Hertz, T, T Jayasundera, P Piraino, S Selcuk, N Smith, A Verashchagina (2008), “The Inheritance of Educational Inequality: International Comparisons and Fifty-Year Trends”, The B.E. Journal of Economic Analysis & Policy 7(2): 1775-1775. Here teacher wages are given in hundreds of dollars per year, so average annual wages for teachers varied from approximately $250 per year for black teachers in Mississippi, to nearly $2,500 per year for predominantly white teachers in New York. To convert to 2018 dollars, using the CPI, multiply by approximately 18.